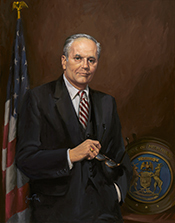 DINGELL, John David, Jr., (son of John David Dingell and husband of Debbie Dingell), a Representative from Michigan; born in Colorado Springs, El Paso County, Colo., July 8, 1926; attended Capitol Page School, Washington, D.C., and Georgetown Preparatory School, Garrett Park, Md. ; Page, United States House of Representatives, 1938-1943; B.S., Georgetown University, Washington, D.C., 1949; J.D., Georgetown University Law School, Washington, D.C., 1952; United States Army, 1944-1946; lawyer, private practice; research assistant, United States Circuit Judge Theodore Levin, 1952-1953; assistant prosecuting attorney of Wayne County, Mich., 1954-1955; delegate to the Democratic National Conventions in 1956, 1960, 1968, 1980 and 1984; elected as a Democrat to the Eighty-fourth Congress, by special election, to fill the vacancy caused by the death of his father, United States Representative John D. Dingell, Sr., and reelected to the twenty-nine succeeding Congresses (December 13, 1955-January 3, 2015); was not a candidate for reelection to the One Hundred Fourteenth Congress in 2014; chair, Committee on Energy and Commerce (Ninety-seventh through One Hundred Third Congresses and One Hundred Tenth Congress); died on February 7, 2019, in Dearborn, Mich.
Papers: 1955-2015, approximately 550 linear feet. The papers of John Dingell are not yet processed or available to researchers. These papers are expected to be opened to the public in 2017 after they have been processed by the congressional records archivist. Oral History: In the G. Mennen Williams and Nancy Quirk Williams oral history project, 1980-1982, 3 linear feet. Interviewees include John Dingell. Sound Cassettes: In the Democratic Party of Michigan sound recordings, 1959-1982, 18 sound cassettes. Persons represented include John Dingell. Papers: In the Democratic Party of Michigan records, 1932-2008, 97 linear feet. Persons represented include John Dingell. Papers: In the Nancy Harvey Steorts papers, 1937-2000, 215.8 cubic feet. Persons represented include John Dingell. Papers: In the Joseph L. Johnson papers, 1960-1970, 3 linear feet. Persons represented include John Dingell. Papers: In the Michael Pertschuk papers, 1949-2002, 59.6 linear feet. Persons represented include John Dingell. Papers: In the Gerry Sikorski papers, 1971-1995, 32.9 cubic feet. Persons represented include John Dingell. Papers: In the Carl Bert Albert Congressional Papers, ca. 1910-1976, 1000 cubic feet. Other authors include John Dingell. A finding aid is available in the repository. Adams, Harreld S. "The Dingell-Lesinski 1964 Primary Race." Western Political Quarterly 19 (December 1966): 688-96. Ralph Nader Congress Project. Citizens Look at Congress: John D. Dingell, Democratic Representative from Michigan. Washington, D. C.: Grossman Publishers, 1972. Roush, Wade. "John Dingell: Dark Knight of Science." Technology Review 95 (January 1992): 58-62. Stanfield, Rochelle. "Plotting Every Move." National Journal 20 (March 26, 1988): 792-97. On June 7, 2013, John Dingell, Jr., became the longest serving Member of Congress. This PDF fact sheet details Dingell's service and milestones.